Marlins Park suites give you an exclusive VIP experience perfect for hosting valued clients, employees, friends and family. As a suite owner at Marlins Park, you will enjoy all the luxuries this modern gem has to offer. From superior hospitality, to incredible food options and VIP parking, we offer exclusive experiences for you and your guests every time you join us at the ballpark. Imagine yourself throwing out the first pitch, delivering the starting lineup, holding your meeting in our executive board room or even "stealing second base." That's the suite life. Located directly behind home plate, the Founders and Legends Suites offer spacious and contemporary accommodations with handcrafted furnishings, premium food and beverage options and unrivaled personalized service. There are 13 Founders Suites and 10 Legends Suites, each distinctively styled to perfection while honoring some of baseball's greatest. For pricing and availability, contact 305.480.2522 or suites@marlins.com. Get the MVP Miami treatment. MVP Suites offer suite holders a private space with spectacular sightlines, world-class comforts and amenities perfectly suited to accommodate your guests. Marlins Park features 12 MVP Suites, seven located along the first baselineand five along the third baseline. Celebrate special moments in our Fiesta Suite. Located along the first baseline with views overlooking right field, these fun and inviting suites allow for a fantastic all around experience at the ballpark. A suite for your company can also provide access to additional executive meeting spaces to share with your clients, partners, employees and prospects before settling into your suite. 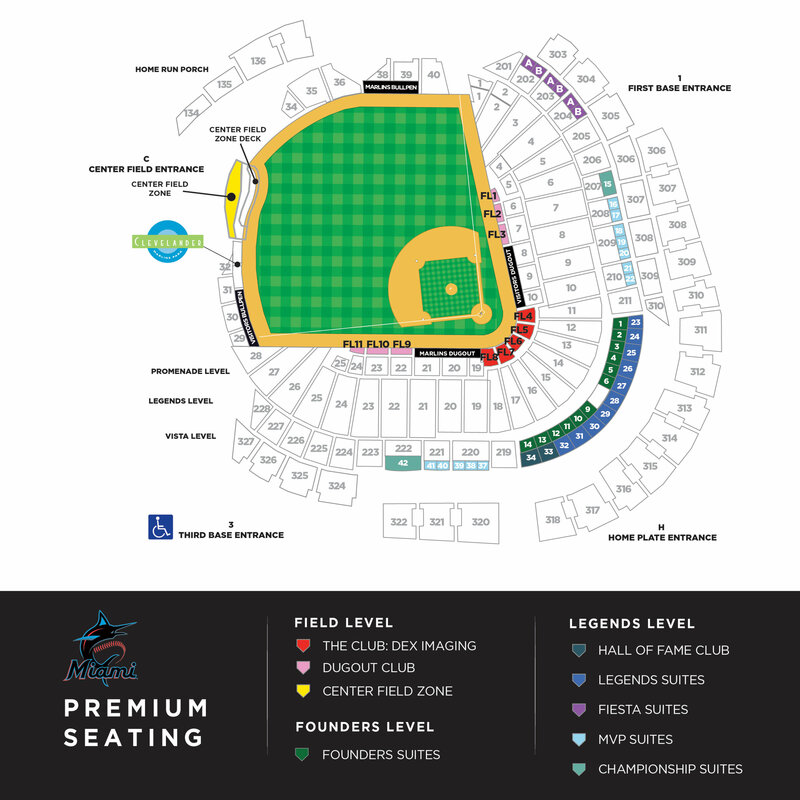 Marlins Park suite plans come in a variety of flexible options for your entertainment needs. Choose multiple game plans in one of our luxury suites. Looking for a one time outing at the ballpark? We also have nightly suite rentals available to impress your guests.